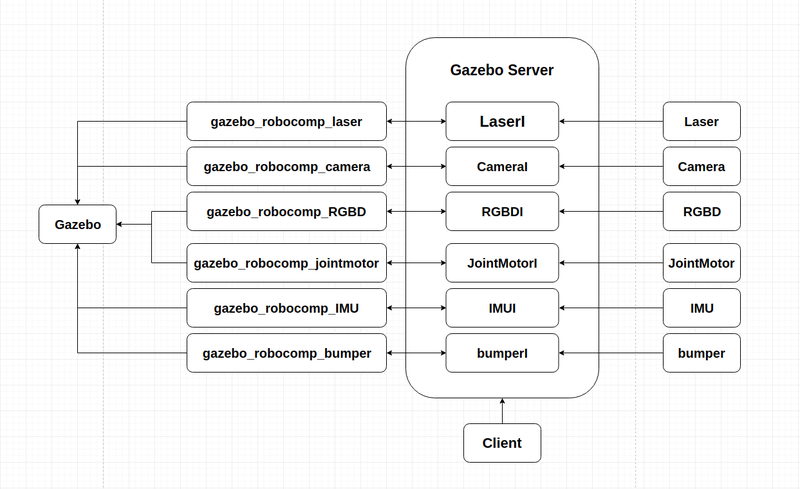 Development of connection between robocomp and gazebo was started approx. two months ago, with an aim to extend the capabilties of robocomp show that it can provide its developers with a simulator which has better physics engine and a large community base already using. Now it is here, gazeboserver, a tool to connect robocomp with gazebo. So, this post is going to go in detail about the integration. Following from the previous two posts in which we get to know about the Slice language and Ice interface, that are actually doing the work, now it’s the time to explain how these customized classes are actually used to communicate with gazebo. A general idea about the integration can be obtained from this figure. Ice.h for ice runtime and LaserI.h for the interface. We initialize the Ice run time by calling Ice::initialize. The call to initialize returns a smart pointer to an Ice::Communicator object, which is the main object in the Ice run time. We then create an object adapter by calling createObjectAdapterWithEndpoints on the Communicator instance. The arguments we pass are “RoboCompLaserAdapter” (which is the name of the adapter) and “default -p 10000”, which instructs the adapter to listen for incoming requests using the default protocol (TCP/IP) at port number 10000. We ceate the servant Laser interface by instantiating LaserI object. We then register the object with adapter to notify a servant is listening at this endpoint. Then the adapter is activated and waits till infinite time to hear the requests from the client. Following the try block there is a catch block which handles all kinds of exception that may happen during the runtime. The client is destoryed in the end, when the its purpose is fulfilled which also stops the server.